the lack of global warming keeping us in this deep freeze this winter would kill off some germs, wouldn’t you? he or she is on a gluten-free diet. I recently posted the question “What do you do for your g-free kid when they are sick?” on Facebook and here are the top responses. These tips apply to kids with stomach bugs, as well as kids whose appetites just aren’t up to par due to other mild wintertime illnesses. *Please note: This is not professional medical advice. 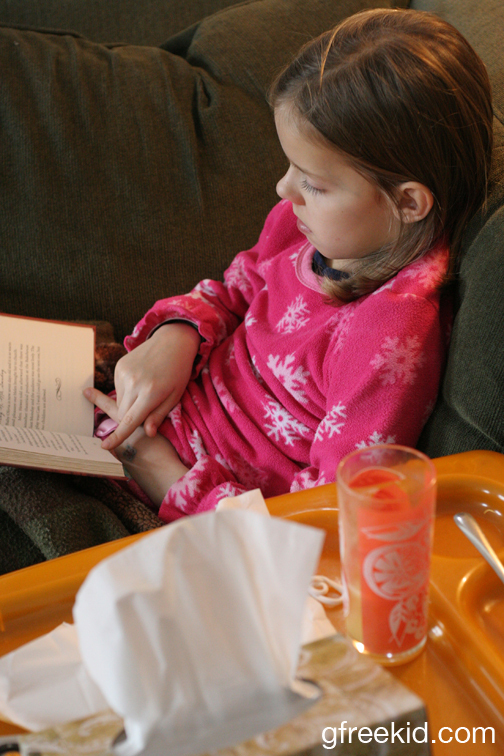 These tips are from parents just like us who have shared their personal advice for how to help sick g-free kids feel better…. Please seek real medical advice from your own family’s doctor for anything out of the ordinary. If anyone wants to add other tips or advice to this list, please comment below. Thanks! Regardless of how these camps are set up, they all seem like excellent environments for gluten-free kids. The directors and food staff seem very knowledgeable about food preparation safety, and some can even accommodate other special diets such as nut-free, casein-free, etc. They all seem to understand the importance of making kids feel “normal” and making sure their campers enjoy themselves without having to think about their diet. able to enjoy camp activities — horseback riding, canoeing, archery, swimming and countless other activities — free from worrying about their diet. It is exciting to know that the number of camps like these continues to grow, which means even more choices when the time comes for my own daughters to attend one. So, why not check out the below links and treat your child to an unforgettable adventure this summer!? Registration has already begun for some of these camps, so sign your child up before it’s too late! Age, cost and registration requirements will vary. Scholarship opportunities and waiting lists are available at some camps. and can accommodate campers on gluten-free diets at any of their mainstream sessions. These camps have partnered with Celiac Disease Center at Columbia University. such as casein, soy, egg and nuts. *Can accommodate children with both gluten intolerance & diabetes. These two mainstream camps cater to celiac/gluten-intolerant kids during any session. 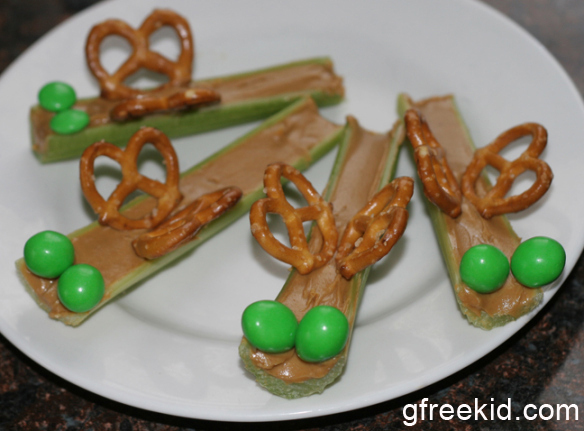 Camp chef is certified in gluten-free meal-planning, and gluten-free food is available. For more info: Call 800-782-3395 or click here and here. Accommodates food-allergic/intolerant and Celiac kids during any session. Separate GF Kitchen Area. Registered Dietician on staff to review menu with each family. Professional Chefs trained in food allergy management and gluten-free meal planning. This camp caters to food allergies and other dietary restrictions. Worry-free weekend for boys & girls ages 8-15. Accommodates both gluten-free and lactose-free diets. A special “thank you” goes out to all of the people who work so hard to offer these amazing camping opportunities to kids like ours! 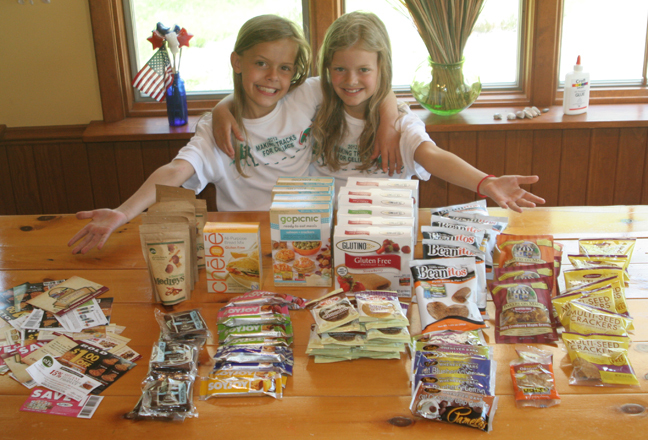 Has your child attended any of these gluten-free camps before? Please feel free to comment below about their experience. Thanks! Aside from their diets, I sometimes feel like my daughters’ “phases” are endless, and I’m helping them “work on” certain things for years at a time…. Right now they are both trying to focus on a Fruit of the Spirit: self-control for one and kindness for the other. How many aspects of life does this simple phrase encompass? Can we clear the road of bullies — or can we prepare our children with how to deal with them? Can we eliminate the risk of stranger danger — or can we teach our kids what to do if they are ever approached? Can we protect our kids from getting their feelings hurt — or can we teach them how to keep everything in perspective and get past it? Can we get rid of all gluten in our kids’ world — or can we teach them how to be prepared and deal with different food situations? But as they grow, you won’t always be there to plow away the snow, salt the icy spots, and maneuver them around the road hazards. Little by little, you will want them to learn to become self-sufficient. There is no magic age at which this happens — it is just something to keep working towards…. For specifics on how you can prepare your child for living in a gluten-filled world, please read this article on helping your gluten-free kid gain independence. 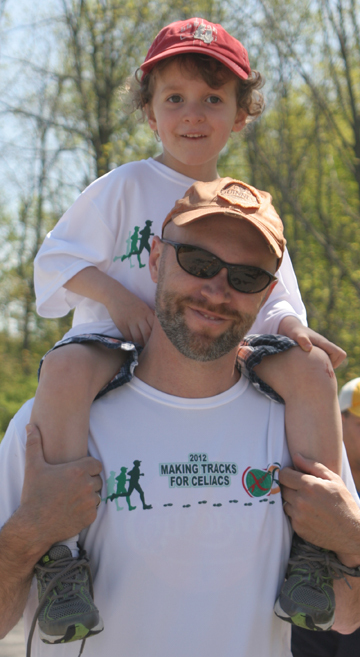 About this time last year, my family and I participated in “Making Tracks for Celiacs” along with extended family and friends, most of whom join us every year for this event which means so much to us. We have been doing this twice a year for 5 years now — forming a team for the Buffalo walk and going just as a family to the Rochester walk. 2013 is the 12th year for “Making Tracks for Celiacs,” which is an annual fundraising event, organized and managed by the Center for Celiac Research at Mass General. These events around the country have raised almost $2,000,000 to date. The money is used to increase awareness and support research (75% of funds) as well as national and local celiac projects (25% of funds). This year there are events held in these states: AL, MD, MI, MN, NY and VA, and are usually planned by a local gluten-free diet support group such as the one I belong to. Check out the main website for “Making Tracks for Celiacs” to learn which cities hold events, which locations are walks versus run/walks, and how you can get involved! Some will be happening soon but others aren’t held until Autumn, which leaves you plenty of time to put a team together — or just enter yourself and/or your own family. We choose to get a local team together because it is a really great way to show support and love to g-free kids, and it’s important for them to see the “regulars” who attend and donate year after year. It’s cool to show them how the numbers don’t dwindle off, either — last year we collected the most money we ever have, and had more walkers than any other year, including many who join us annually. My girls know they are not forgotten and that they are backed by many friends and loved ones on their gluten-free journey. It’s something they look forward to every year. 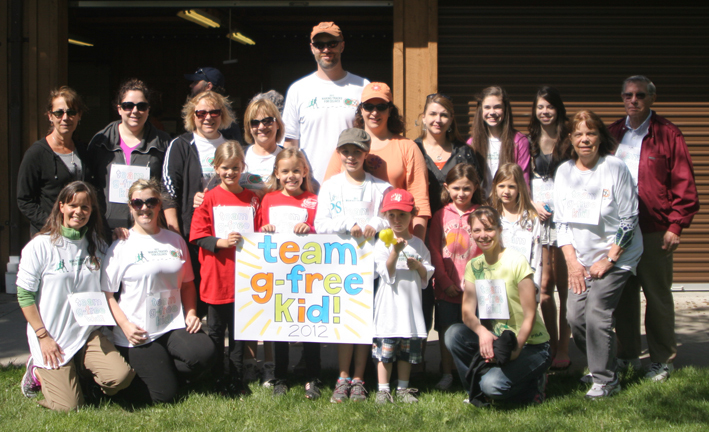 Our team last year was called “Team G-Free Kid” and together we raised $545 to donate to the Center for Celiac Research, along with entry fees paid by over 20 team members. Even though that seems like a lot to us, other “go-getters” have already collected thousands of dollars each for their teams! If you’d like to collect donations (it’s not mandatory) you can easily start your own personal donation page or team page through CeliacWalk.org, and email your friends and family about it. Registration is simple as well. Everything you need to know is in the green column on the lefthand side of that site. For the first few years, Morgan was the star of our team, but now Lindsey shares the spotlight, too, since she’s been gluten-free for over a year now. We also had a newly gluten-free and casein-free friend (below) and his family join our team for the walk last year, plus dozens of other kids in attendance. 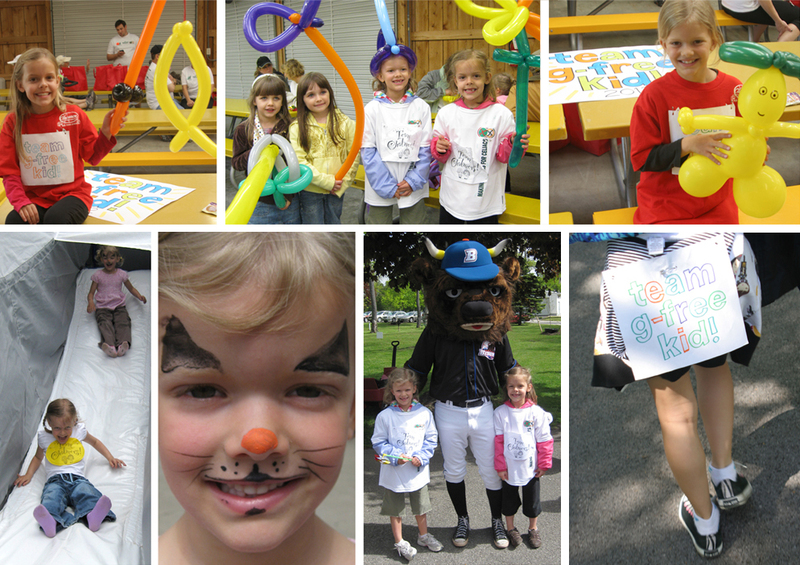 At both of the walks we attend, there is always a ton of stuff for kids to do….clowns, balloon artists, face painting, fake tattoos, stickers, bounce houses, games, local mascots in attendance, special kid goodie bags, story time and all kinds of things. Obviously, different locations will have different activities, but from what I hear, most, if not all, are very kid-friendly. At this year’s walk, the organizers were also selling these awareness bracelets which support the Center for Celiac Research. For more details on these, please read this post. There are also a good number of local and national gluten-free food vendors at these events as well, giving out free product samples, coupons and learning material… Many thanks to the generous companies who donate goods towards these walks! And if the other events are anything like the two we attend, rest assured that you will bring home a crazy amount of gluten-free samples, bars and full-sized product packages. And, if your friends and family are anything like ours, much of their food (from their own goodie bags) will be passed back for your family to enjoy. All in all, we get a lot out of these walks. When you are among so many other gluten-free folks, there is a huge sense of camaraderie, and you know you are supporting a great cause: celiac disease (and non-celiac gluten sensitivity) research and awareness. Our daughters feel special — especially at the walk where we form a team, and they are always excited about all of the samples they get to try and take home, knowing everything is gluten-free and there’s no need (for once) to question anything. The walk itself is good, healthy family time that you can really soak in and enjoy, knowing that you’re making a difference and that your kids are swelling with pride. #1: Get some people together and start one (see “How to start your own walk” on CeliacWalk.org) in a new location; #2: Donate online towards the cause; or #3: Try something different: Join Team Gluten Free for any race around the country. How does it work? Read more about one family’s experience here. 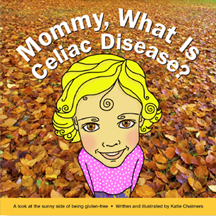 As we like to say, “Celiac disease isn’t contagious, but awareness is. 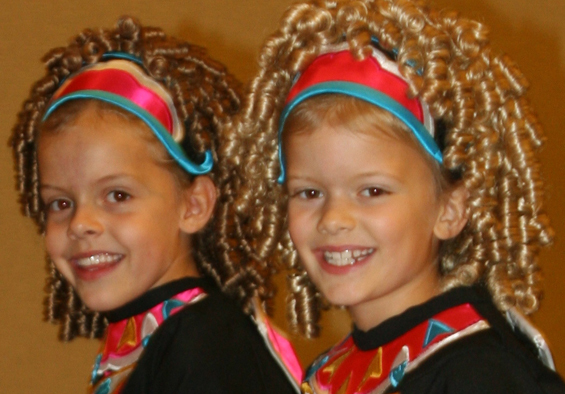 especially since my daughters are Irish dancers. We don’t have their schedule yet, but it’s sure to be a month chock full of dance shows and everything else life brings. throughout the month, just like we do for Valentine’s Day in February. There are far too many fun things to do with those holidays, than to limit it all to just one day a month. Wouldn’t you agree? 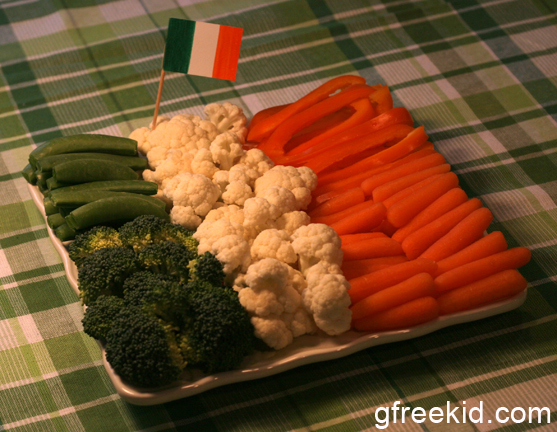 With this first idea (which is nothing original, I’m sure) I just arranged green, white and orange veggies in the shape and color order of the Irish flag. I used snap peas, broccoli, cauliflower, orange peppers and baby carrots. The subtlety of this idea may be lost on little ones, so a mini Irish flag (we made this one w/ markers, paper and a toothpick) helps make the connection. 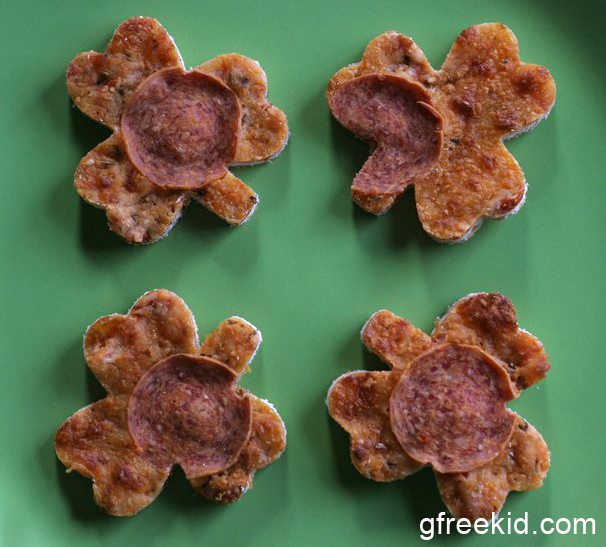 Another simple idea just involves cutting already-baked, g-free pizza (we use Chebe for the crust) into shamrock shapes with a cookie cutter… what could be easier? 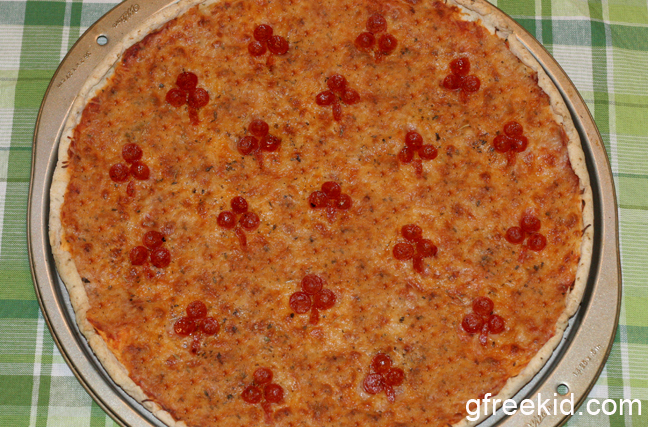 For the pizza below, I arranged Hormel mini pepperoni in the shapes of shamrocks all over the top of the (Chebe crust) pizza. 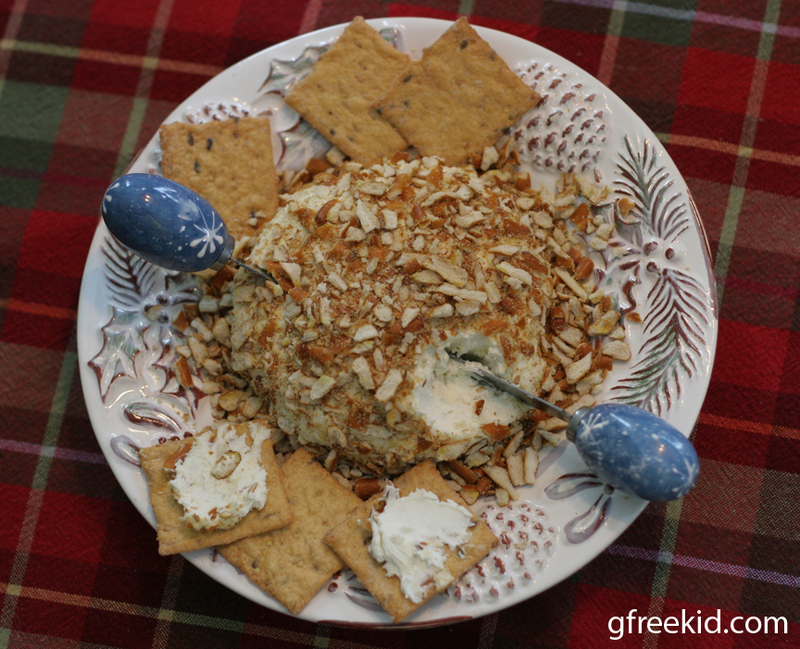 Just watch that your cheese doesn’t get too over-cooked and dark, or your shamrocks won’t stand out enough. 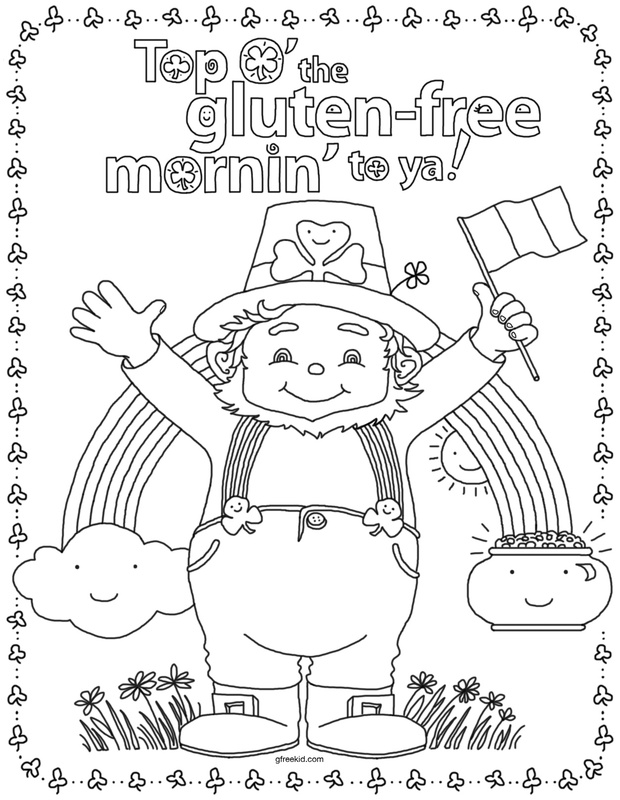 Next I’ve created a gluten-free coloring page for your g-free kid to enjoy. Please fee free to post a picture of your child with his or her finished coloring page on my Facebook wall! 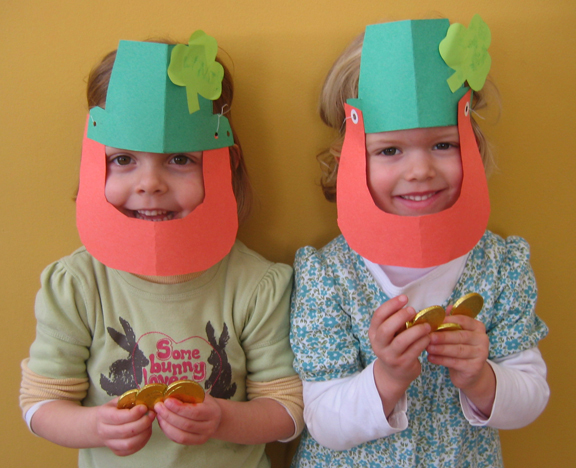 Happy St. Patrick’s Day (month) everyone! 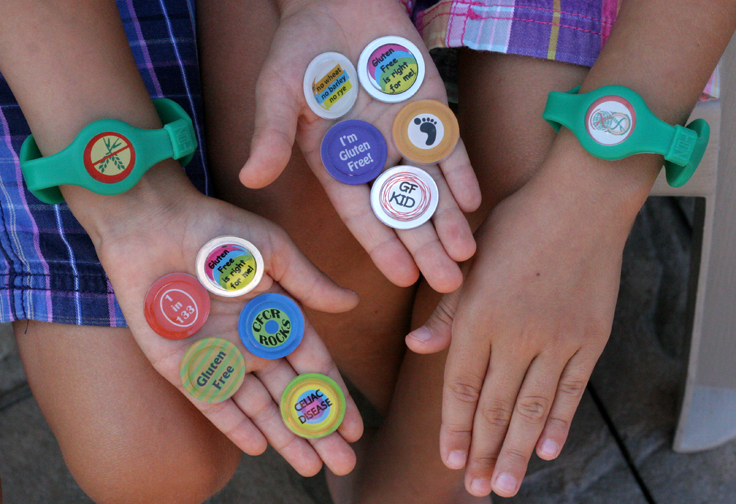 Be sure you see the photo album of g-free kids and g-free kids’ stuff page. For much more in between posts, follow me on Facebook and Twitter. When older kids begin looking at packages, the terms “multigrain” and “whole grain” can often be confounding (even for adults) so be sure to explain to them that just reading those words on a package doesn’t mean it is automatically ruled out. My girls used to think that, until I saw their confusion and explained how corn and rice can be considered multigrain or whole grain, too, yet those are still acceptable grains & flours for g-free kids. Teach them that oats need to be certified gluten-free to be considered safe, and other similar tips. Start label-reading lessons small, by going to Grandma’s house and showing them offending ingredients on labels. Then go home and have them read labels on their own gluten-free products so they can see what is okay. 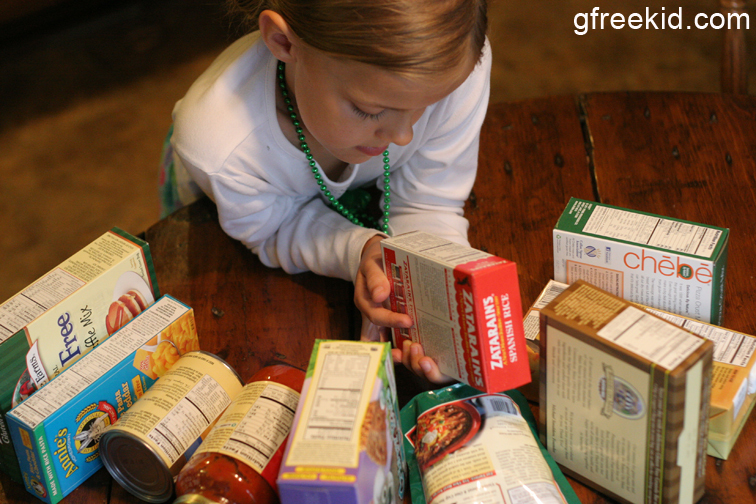 If your child is old enough and has a long enough attention span, spend some time together in a grocery store (at a slow time of the week) and go through it aisle by aisle, explaining which kinds of food are gluten-free or not. Be matter-of-fact and show them how entire sections of entire aisles are off-limits, but linger in the areas that are full of safe foods and marvel at all of their choices. Show them how most yogurts and ice creams are GF except those with cookies, brownies, sugar cone pieces, etc. Show them all the naturally gluten-free foods and the special area where the gluten-free products are. I do this with my daughters every now and then to test them on what they know, and they, in turn, always love to demonstrate their growing knowledge. If this sounds too overwhelming for a younger child, then just do it in small doses on a regular basis as you do your weekly shopping together. It may take some time, but it’s very beneficial for your child — and something to be proud of — for them to be able to show you what he or she knows. When eating out, kids of all ages can learn to speak up for themselves to varying degrees. Young kids can learn how to ask, “Is this gluten-free?” or “Is this safe for me to eat?” Let your child order for themselves in a restaurant and have them politely inform the waitstaff that their meal needs to be gluten-free. Even if you plan on discussing details with the waitress, manager or chef yourself (which I would advise in order to avoid cross contamination) it is important for your child to get in the habit of always making sure people know that he or she needs to eat g-free. 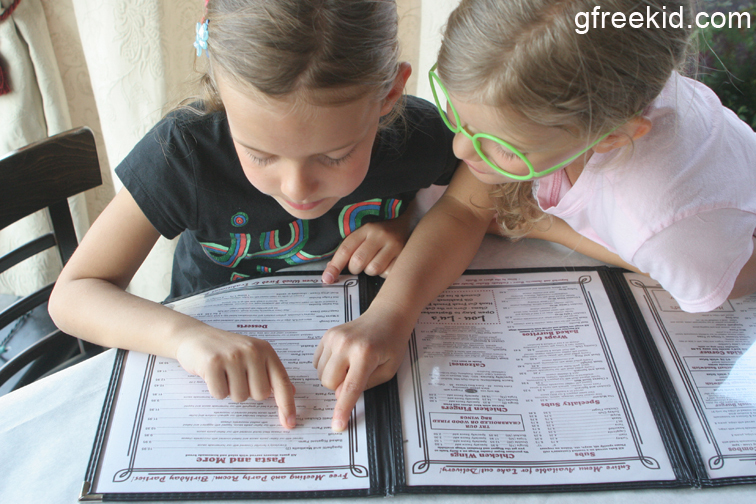 If your child is old enough, test them to see if they can correctly name the gluten-free options on menus at restaurants by themselves. Explain why they can’t eat certain things like french fries, which are deep fried in shared fryers with gluten-containing foods like breaded chicken fingers. Let them ask if there is a dedicated fryer or not. The older a child gets, the more he or she needs to have these habits set in place. The more they practice, the more comfortable they will get with the necessary dialogue. Your child will be filled with pride as he learns these life-long social lessons. 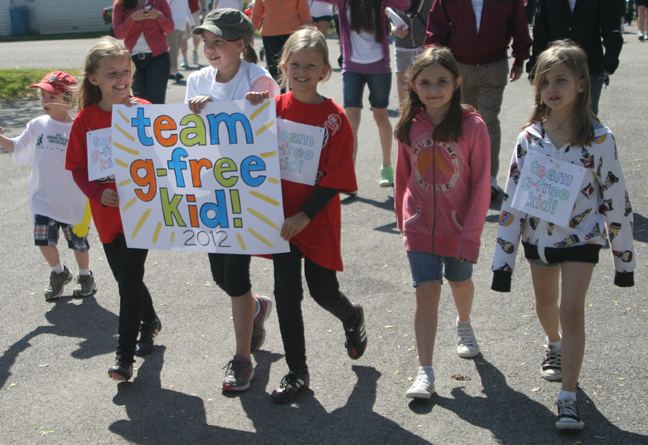 Can you think of any more ways to help your g-free kid gain independence? Please comment below if you have anything to add…..thanks!
. . . . . . . . . . . . . . . . . . . . . . . . . . . . . . . . . . . . . . . . . . . . . . . . . . . . . . . . . . . . . . . . . . . . . Keep coming back for more ideas for g-free kids, and don’t forget to check out the photo album and kids’ stuff page!